Resident Evil or Resident Hell’s Angels? 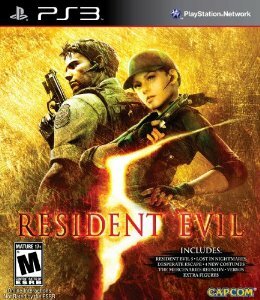 Structured much like part 4, Resident Evil 5 takes the series even further into action game territory and away from the original atmospheric, tense, suspenseful and often frightening series that longtime fans came to love. What makes this installment better than part 4 for me (aside from the fact that our protagonist, super buff Chris Redfield, has definitely been pumping the pixels since his last appearance in one of these games) is that you can play this game co-op. The latest form of “zombies” are more the frantic running types made popular by 28 Days Later, rather than the classic flesh eating, meandering variety that originated with Night of the Living Dead. Oh yeah—and these new mutations not only run, they throw axes, hammers and spears, carry shields to protect themselves from your bullets, and even shoot guns and arrows at you. To top it off, they also ride motorcycles. Yes, this is what Resident Evil has become. Zombies on motorcycles—in the jungles of Africa, no less. Gone are the creaky stairs and doors of desolate mansions, or the far off squawk of diseased crows in a city that has become nothing more than a ghost town riddled with bodies, some dead, some undead. No more feeling of dread when you turn the next corner. Now, you just spend all your time running and shooting. In fact, you barely even pay attention to the files and documents you find along the way that explain the “story.” These “zombies” could be anything—mercenaries, enemy war soldiers, pirates, mobsters—because this is just like every other type of action game. Making this game two players did wonders, because it truly is a blast to play—and way easier than trying to take on hoards of zombified African villagers alone. It’s a great action game. But it’s not Resident Evil. Capcom clearly wanted to expand the audience of a series that already had a dedicated following, but by completely changing the genre of game, they’ve isolated their original fans. New fans worship the series now, badmouthing the earlier installments with all the backtracking, puzzles and the “clumsy” controls. Many of us never had a problem with the original controls. And just like any other type of control scheme, if you don’t like it, then don’t play the game. This epidemic has pretty much spoiled everything that made survival horror its own unique genre. 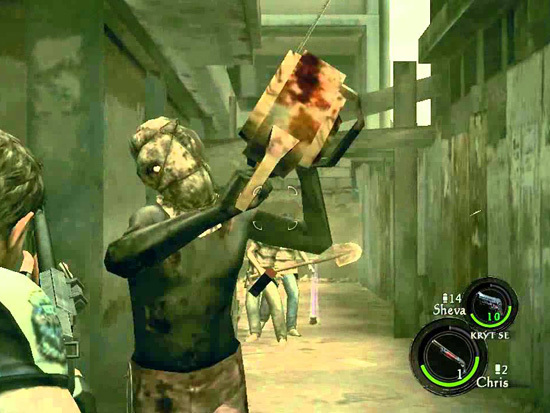 Dead Rising is a repetitive action game, moving the zombies into a shopping mall in true Dawn of the Dead style. Alone in the Dark: Inferno is a continuous battle against monsters that are big, hard to beat and always surrounding you, and you even have to do tons of driving while getting a beat down by these monsters as they leap on your car roof, because you can’t shoot them off while driving. Silent Hill: Homecoming lacks the terrifying atmosphere that the original series excelled at, instead forcing you to fight numerous creatures—yet still limiting your ammunition like in a traditional horror survival game! And Fatal Frame, while retaining the classic formula, has been bought by Nintendo so it can’t be released multiplatform—and also was not released in the U.S!!! Playing the Game: Can co-op save the series? In the past, I’ve manned the controls while my video game partner in crime kept me on track with a walkthru as I got lost in the labyrinth-like corridors of ominous mansions, evacuated city streets, desolate laboratories, scummy sewers loaded with giant poison spitting spiders, and shadowy parks and gardens swarming with creepy crawlies and a variety of statue, medallions, and jewel puzzles. 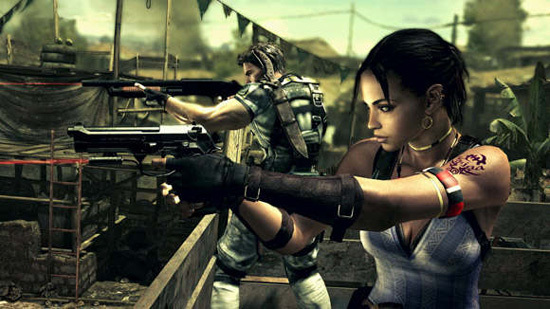 Resident Evil 5 manages to pull us even farther away from the isolated, eerie situations and locations of the original series, with even more weapon-wielding angry villagers, as well as loads of baddies with guns, bombs, and bigger artillery. You could exchange these zombie-faced baddies for army soldiers or mobsters and the gaming experience and atmosphere wouldn’t be any different. Resident Evil is no longer a horror series. It’s an action series with occasional horror themes. 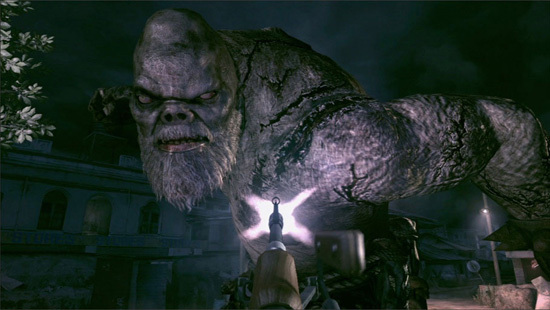 Resident Evil 5 does throw in some Lickers to satiate longtime fans of the original game, and you encounter a couple of other ghastly beasts, but the majority of the game is spent exchanging gun fire and avoiding grenades. The saving grace of this installment is indeed that Capcom has made Resident Evil co-op for the first time ever. So my friend put down the walkthru and accompanied me on this not so horror-intense journey. It was definitely a blast. You really feel like you’re in a movie. The game is split screen, one character’s screen on top, the other’s on the bottom, which makes the visuals tough to see at times unless, perhaps, you have a 60” screen to make each smaller screen seem bigger than on my 34”. Trying to read files and notes in the game was brutal because the print was so small on the not-so accommodating backgrounds. 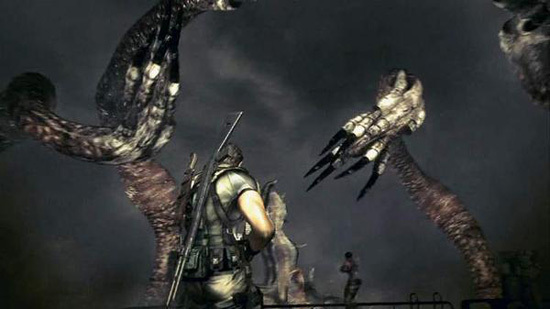 Also, unlike the original series, which had plot-explaining files spread throughout the game, Resident Evil 5 tends to have you experience non-stop action for a couple of hours straight. Then suddenly you get a breather when you enter a room loaded with exposition on extremely long files and computer documents, which really spoils the pacing. 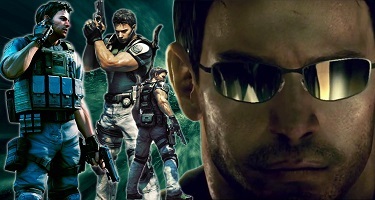 Which is why it’s good to have Chris Redfield around to look at…. As for the co-op play, more often than not, we’d make the mistake of separating when we reached a new area instead of sticking really close. For instance, when we entered a seemingly abandoned African village of huts loaded with ammo and health, we did just what you’d do in real life—we totally ran amok and looted the place. Unfortunately, by doing so, we ended up triggering two separate villager onslaughts that should have been taken in waves if we’d stuck together and entered the two trigger spots one at a time. I’d be screaming that I was trapped in some ramshackle arena with two giant natives while my friend would be screaming that she couldn’t help me because she was trapped at the dead end of a river with villagers surrounding her. We learned our lesson after that and began sticking together, but even then the game would sometimes force us to separate. I’d assist my friend by catapulting her over a wall or gap so she could go pull a lever to lower a bridge for me to join her, but before she’d get to it, she would be swarmed by enemies! This was fun, not only because she’d be screaming in terror while I laughed so hard tears were streaming down my eyes, but because I could give her backup by pulling out my sniper rifle (you know, after wiping the sight-blurring tears from my eyes). Co-op added some other interesting aspects to the gaming mechanics. As you gather treasures during the game, you can sell them to buy upgrades for your weapons. Unfortunately, you can either spend the money on fully upgrading one person’s weapon to create one powerhouse baddie destroyer, or only slightly upgrade each person’s weapon, leading to two weaker guns instead of one super weapon. It’s something two players have to decide together—will we both have to fight harder with slightly upgraded guns, or will one of us be a vulnerable backup with a wimpy weapon as the other stays up front with one heavy fire power weapon? Sharing health is another catch to the experience. What’s cool is, if the two of you stand near each other when you administer health, you’ll each get a bit of health (instead of either of you healing fully). Also, if one character is near dying, the other character can run over to you and ‘resuscitate you’ with the press of a button (looking onscreen as if she’s jabbing a needle in your heart like something straight out of Pulp Fiction). This little additional rejuvenation can conveniently draw out your near death experience until you can get to safety and heal more plentifully. Another complication is that everything is done in real time. No more escaping the gaming chaos by hitting the inventory button to heal or reload ammo or, as this game lets you do, exchanging items with a partner in relative ‘pause’ safety. This makes for some difficult and challenging moments during major boss battles, when your friend has picked up ammo you most desperately need for your gun, but you’re both being bombarded by some fire-breathing, slime-throwing, tentacles-swinging monster relentlessly. And speaking of difficult, we opted for EASY mode when we played, which promises to let you enjoy the story and journey…and it was frickin’ HARD. Then, to insult our confidence in our gaming abilities, we read a review about the game in which the critic claims that hard mode is too easy! Whatever! 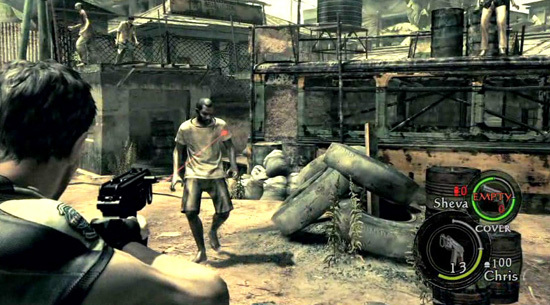 Resident Evil 5 is a fun game. A really fun game. If you play it with another person (which you can also do online with a complete stranger). But I can’t see myself ever playing the game alone (in which case, your partner is AI). I’ve replayed Resident Evil Zero through Code Veronica numerous times because the chilling atmosphere gets you every time when you’re going it alone, immersing you in your own interactive horror film. But without any moments of sheer terror to be found in this game (the sensation has been replaced by panic and button mashing when being bombarded by baddies), it would be nothing more than a tedious task to get through this game alone. This entry was posted in The Evil of the Thriller - Everything Horror, What I'm Doing With My Joystick and tagged horror-survival, Resident Evil 5, video games. Bookmark the permalink.